The future is Pennine Lancashire, the legacy is Tony Wilson’s. This week we formally launched a new brand for Pennine Lancashire, which we developed with our good friend and collaborator Peter Saville and Livesey Wilson Associates. The brand has been commissioned by Elevate, Pennine Lancashire’s Housing Market Renewal pathfinder and will be used both as a ‘flag’ under which regeneration projects will be taken forward and as a more conventional destination brand for the area. The launch took place at Stanley House in the hills above Blackburn and included a string of tributes to Anthony H Wilson, whose vision of a ‘Seattle-style’ revinvention of the area has already launched a host of projects and brought in new energy and new ideas. We raised a flag, too. The new brand is made up of a new graphic device called ‘Contour’ and a type treatment for ‘Pennine Lancashire’ that will be used by a host of partners across the areas of Blackburn with Darwen, Burnley, Ribble Valley, Hyndburn, Pendle and Rossendale. The project was first conceived in the 2005 report ‘Dreaming of Pennine Lancashire’ which was written by tony and his partner Yvette Livesey, both of whom played a central part in the creation of the new ‘Contour’ brand. For us, this is the latest in a line of place branding projects that have been strongly related to our region’s stunning natural environment. The important thing for us - and I’ve said it before on this blog - is that a place brand has to represent the truth of environmental and social connections that the individual will make when arriving or experiencing place. For locals, they need to feel pride in a brand and recognise it as a faithful representation of their area; for visitors, they need to recognise the brand when they arrive and not feel that they have been duped or lied too as that is no way to build long term brand loyalty. In short, your brand is what you’re known for and should be a faithful response to the place in question. Our new brand for Elevate and the partners across Pennine Lancashire has primarily been designed to inspire, engage and empower the people of the area to continue their work towards an economic and social renaissance. It is as much about pride as it is tourism. The graphic device conceived by our design team is called ‘Contour’, a panoramic fusion of multi-coloured contour lines that does more than just replay the landscape of the Pennines that represents such an important framing element for communities across Rossendale, Burnley or Blackburn... it also suggests other important dimensions of Pennine Lancashire such as weaving, canals and rooftops. The lines of Contour are not static. They form a range of shapes to become suggestive of an urban landscape, for example, or of a lowland area bounded by canals or waterways. The ribbon-like shape of the graphic helps to inform its deployment and suggests a variety of uses from panoramic boundary signs to illuminated fascias, gatefolded print and 16:9 screenshots. The new Pennine Lancashire brand also includes a type treatment based on Res Publica Medium, a face that was selected as a modern take on the traditional serif and that would prove bold, robust and readable when used across a very wide variety of environments. It also provides a strong and solid anchor point for the more lyrical and dextrous graphic element of the brand. And even though we’re terribly proud of the new brand we;ve created, there was much more on offer at the launch this week. The launch also included the unveiling of plans for ‘Weave’, an iconic multi-use redevelopment of a historic mill in the Weavers’ Triangle, Burnley that is being developed by Ralph Ardill of the Brand Experience Consultancy. There was also an update on other key projects such as Chic Sheds, Sound Investments and Pennine Lancashire Squared. Anyway, back to the new brand! Our recommendations are that it will have three key areas of use. The first use of the brand will be a as a ‘flag under which we rally’ and builds on the words of Livesey Wilson Associates who wrote that “the disparate elements of East Lancashire need a flag to march behind, a unifying symbol to lead them to top of the mountain known as ‘successful regeneration’. The second use of the brand will be as a more traditional ‘destination’ brand for promotions that will attract visitors or investors to the area or that will mark out your entry into, or experience of, Pennine Lancashire. Walking or cycling guides, targeted promotion at gateways, boundary markers or themed events are all good examples of where the use of the Pennine Lancashire brand will be considered. Here the Pennine Lancashire brand has been designed to consciously connect to a ‘drivetime’ audience that is aspirational, creative and upmarket; the ‘creative class’ set out in the original Livesey Wilson report in 2005. It speaks to professionals in Liverpool, Manchester, Preston and Leeds and has the potential to unlock a day visitor market that could in time translate into new residents, new business start-ups and new investments in the area. The third and final use will be as an endorsement or ‘kite mark’ for other projects denoting their shared lineage and set of aspirations. We’re proud to have worked on it and proud to have worked with Anthony H Wilson. Creative Concern (celebrating five years in business this year by the way) has launched a new concept that is set to change the face of billboard advertising, with an installation in Merseyside that replaces carbon-intensive materials with a living hedge of native willow trees. Here’s our press release about it: The Green Billboard is a sustainable advertising medium made entirely from willow trees with a range of environmental benefits conventional hoardings cannot offer – reduction of noise pollution, increase in tree coverage and a natural screen for unsightly developments. And socially and economically a green billboard can also represent a long-term investment in the landscape with its fresh and unusual organic materials that make for a visual high point for local communities. The first installation of the willow billboard is already in place and can be seen from the M53, situated on a new woodland development in Merseyside at Bidston Moss and follows months of meticulous planning by the ethical agency in partnership with Cheviot Trees and fellow design agency, Modern Designers. “Our urban environments, which are predominately those areas where we see the biggest collections of hoarding are set to suffer a ‘heat island effect’ due to climate change. The green billboard goes some way to respond to this challenge as well as addresses the problems of air and traffic pollution by utilising trees as a natural filter. "For the Bidston Moss design, which celebrates the greening of the Northwest, we've created a billboard that literally allows the leaves of the trees to grow through it, fusing a dramatic and powerful message with the very same medium that is carrying it; green billboards have great potential for innovative design responses, particularly as part of regeneration schemes like this one." 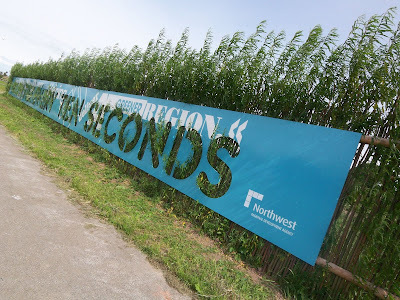 Measuring 30m by 2.5m the only sustainable outdoor advertisement in this world was delivered on behalf of the Northwest Regional Development Agency (NWDA) and the Forestry Commission (FC), and displays the partnership’s message ‘ One Tree Is Planted Every Ten Seconds In This Region’. The billboard has been established on a new community woodland area at Bidston Moss on the Wirral Peninsula, one of a number of derelict or under-used sites being reclaimed as part of the Northwest's £70 million Newlands programme. By utilising hand-cut letters fixed onto the hoarding, the organic nature of the NWDA and FC’s advertisement will be able to evolve, allowing the branches of the growing willow to show through, becoming an integral part of the green billboard. And unlike traditional outdoor advertising mediums, including digital and mobile street furniture, the green billboard offers a fresh and innovative communication channel that demonstrates real social and environmental commitment to their customers. Creative Concern is busy working with Peter Saville on a new brand for Pennine Lancashire. The process has involved discussion ‘place brands’ afresh with a whole host of local stakeholders, agencies and politicians. The launch of the brand is on 17 September and we hope it will be a fitting tribute to Anthony Wilson, a good friend whose vision we are working to in this project. For us, branding spaces and places is a creative activity that stands well apart from the creation of logotypes and graphic banners for consumer goods, service companies or fashion labels. The first and most obvious distinction is that the brand has to be true to the experience of the place itself, both for the indigenous population and for the visitor. overlay that knowledge with anything other than a faithful creative response is misguided and ultimately flawed. If you promise sylvan wonderlands, polished palaces of alabaster or streets paved with gold then the reality had better meet that promise, or visitors and residents alike will lose faith in the brand immediately. Another vital distinction is that its brand is not simply a slogan or a strapline with a colourful badge attached to it, designed to attract and secure a notional horde of peripatetic tourists or international investors who may, or may not exist. Too often when towns or cities create a new logo or strapline it is more of a civic cry for help than a call for the partners to rally around a shared vision of the future. This latter mission, a rallying call, is the intention of the Pennine Lancashire brand. It is much better to describe this brand for Pennine Lancashire as a banner under which partnerships come together to achieve great things. And if that banner attracts visitors, too, then all the better.